In Hollywood, mistakes are magic! How can that be? Aren’t mistakes usually a bad thing? I went on a cruise with my daughter who is represented by a modeling/talent agency. We traveled to Catalina Island down to Ensenada, Mexico. There were some great agents from across the country to judge the competition, and my lovely daughter received awards in 5 of the 7 categories and a scholarship for a conservatory in New York City. Now, he was probably talking about acting in movies or commercials and how messing up the script can be a good thing. Maybe making a mistake on the script makes it even better! When my daughter and I arrived home from our cruise, we drove from the airport towards my brother’s house as I needed to borrow his truck for a gardening job. I often make mistakes by getting lost when I’m driving. I felt like I should take the exit towards Las Vegas but hesitated and missed it. Then I realized that is the one I should have taken to get onto the freeway to head south towards my brother’s house. After driving a little further, I decided to take an exit so we didn’t end up in Colorado (we were in Utah)! I soon realized I wasn’t too far from my brother’s house. He called my daughter’s cell phone and asked if we were almost to his house. He said there had been a terrible accident on the freeway (that we hadn’t made it to) and that some people had been life-flighted to a hospital. The traffic was backed up for miles! Was my driving mistake magical to us? We may or may not have ended up in the accident, but we would have been stuck in traffic for a long while instead of arriving safely at my brother’s house and then going out to enjoy some dinner together. I also believe my daughter and I were divinely guided and protected. Sometimes we are spiritually guided for our safety and protection when we listen to the “gut feelings” that we have. I was unsure about taking the Vegas exit. That unsure feeling was for a good reason this time! I picked some beautiful tulips from my front yard to use as a centerpiece for the Mother’s Day dinner I was preparing for my mom. They were a beautiful peachy color and one of my favorites from my yard. 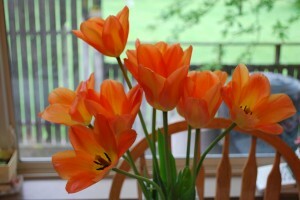 Two of my grandchildren had picked most of the tulip buds from my backyard before the tulips had even bloomed. I was a little sad that the children had ruined the flowers. 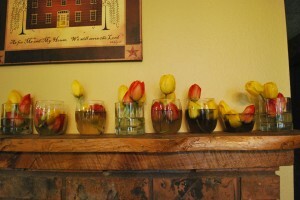 However, my husband said he would put the dead-headed tulips to good use. I thought the flowers were useless. He put them in small glasses of water and lined the fireplace mantle with them. Beautiful! Mistakes made magic! Please leave a comment about what mistakes have been magical for you! This entry was posted on Friday, May 13th, 2011 at 2:23 pm	and is filed under Living a Joyful LIfe. You can follow any responses to this entry through the RSS 2.0 feed. Both comments and pings are currently closed. My website is Low carb diet plan. I just came across this and I so remember that mistakes are magical. Hope all is wonderful and you and your family are doing well. Hi to your daughter.